John Ferren was born in Pendleton, Oregon on October 17, 1905, but soon after his birth his family began a series of moves to different parts of the Northwest. They settled in San Francisco for several years during Ferren’s childhood but again relocated to Los Angeles, where he would graduate from Polytechnic High School in 1923. In 1925 Ferren returned north to San Francisco to attend the California School of Fine Arts. There he began modeling portrait heads in clay and plasticene during his apprenticeship with an Italian stonecutter. According to critic Dore Ashton, “Ferren was, from the beginning, a Bohemian who disdained formal procedures and wished to structure his own culture. As a youth he gravitated naturally to the implacable American dissenters” (“John Ferren, 1905-1970”). His childhood friend and fellow artist, the poet Kenneth Rexroth, was also “hellbent to distinguish himself from those who tamely retreated into academe [and both Rexroth and Ferren] admired the dashing individualism of Henry Miller” (“John Ferren, 1905-1970”). Like Miller, Ferren became restless in the States and by 1929 he had saved up enough money to travel to Europe. He first stopped in New York City to view the Gallatin Collection. He then continued on to Italy and France, and on a trip to Saint Tropez he met artist and teacher Hans Hoffmann (1880-1966) as well as several of Hoffman’s students, including Vaclav Vytlacil (1892-1984). Though Ferren had been trained as a sculptor in California, Hoffmann influenced him to become a painter. During a visit to Munich, Ferren was further moved to transition from sculpture to painting after seeing an exhibition of Henri Mattise’s work. After a year in Europe, Ferren returned to San Francisco for his debut solo exhibition at the Art Center, but the “lack of energy and artistic stimulation on the west coast at that time” made for a very short-lived stay in California (“Biography: John Ferren, 1905-1970”). By 1931, “Ferren’s early taste for the unorthodox led him [back] to the only permanent Bohemia of those days, Paris,” where he would remain most of the time until 1938 (Ashton). Although he briefly attended the Sorbonne in Paris, the Universita degli Studi in Florence and the Universidad de Salamanca, and though he sat in on classes at the Sorbonne and informal drawing courses at the Academie Ranson and the Academie de la Grande Chaumiere, while in Europe Ferren mostly steered clear from the formal training of art schools and institutions. Instead, he learned about art while surrounded by other artists at Parisian cafes. According to Ashton, it was in Paris that Ferren “built himself a painting culture the true way Bohemians do: through listening with a sharp ear to the animated conversations in the cafes of Montparnasse and the Latin Quarter; through dropping in to paint and sketch at the open academies […], and through seeking out the artists whose work intrigued him” (John Ferren, 1905-1970). Before he was thirty years old, Ferren had found a way to become a part of the Paris art scene and to “circulate freely among Paris’s most celebrated avant-gardists” (Ashton). His experiences in Europe exposed him to such early twentieth-century art movements as Cubism, Surrealism and Expressionism. In Paris he was “introduced to William Stanley Hayter’s Parisian Atelier 17, where some of the greatest artists of the 20th century, such as Joan Miro, Max Ernst, and Marcel Duchamp participated in experimental workshops” (“Biography: John Ferren, 1905-1970”). 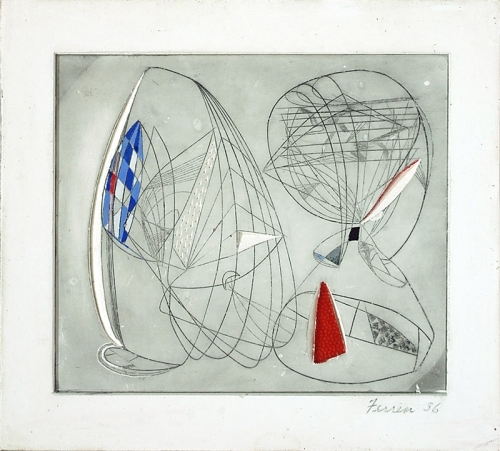 Ferren deepened his immersion in the Parisian art community when he married the daughter of Spanish artist Manuel Ortiz de Zarate, since “through this union he met the circle of Parisian-Spanish painters that included Picasso, Miro, and Torres-Garcia” (“Biography: John Ferren, 1905-1970”). Despite writing anti-Surrealist manifestoes with fellow artist John Helion, Ferren nevertheless remained close to Max Ernst and Andre Breton while continuing to illustrate books by Surrealist poets. In Paris Ferren also met gallerist Pierre Matisse, who in 1936 hosted a solo exhibition of Ferren’s art at Matisse’s New York gallery. Following his divorce in 1938, Ferren returned to the United States and settled in New York City. It “was not long before he established himself in New York’s Bohemia where he functioned as he had in Paris as an indefatigable adventurer in the realm of ideas” (Ashton). Soon his works were being exhibited throughout the United States, particularly at Pierre Matisse, for whom Ferren had first created his distinctive etchings on plaster in 1937. In 1935, George L.K. Morris and Albert E. Gallatin had been the first Americans to purchase Ferren’s Parisian works, and they continued helping him gain entry to exhibitions with the American Abstract Artists group until 1940. Ferren further integrated himself into the New York art community by becoming a member (and later president) of The Club, “an informal group of artists who represented the social and intellectual center of abstract expressionism in New York” (“Biography: John Ferren, 1905-1970”). In 1947, Ferren returned to California and built a summer studio in the Los Angeles suburb of Brentwood. He taught summer sessions at the Art Center School and UCLA, even as he continued to explore new varieties of art. In the late 1950s Ferren joined forces with film director Alfred Hitchcock, serving as artistic consultant for the films The Trouble with Harry (1955) and Vertigo (1958). Ferren remained active in the art world until his death on July 24, 1970 in East Hampton, New York. Though Ferren initially trained as a sculptor, his abstract paintings are his most noteworthy works. During his initial years in Paris he witnessed a growing rebellion against the “excesses of the Surrealists.” Ferren, however, “young and unbiased, freely assimilated various views. In his own work during the first couple of years in Paris, he first adapted the spaces learned from the followers of Picasso’s synthetic cubist period, and, a little later, introduced a more relaxed, slightly surrealist note.” Ferren realized that he was painting in a “modified constructivist idiom” but made sure always to “preserve a certain lyrical freedom” (Ashton). In the mid-1930s Ferren became a regular visitor at William Stanley Hayter’s Atelier 17, where he renewed his past sculptural interests. Hayter had invented “a technique of etching a plate and pouring plaster so that the plaster surface revealed the etched line. Ferren enthusiastically extended the technique, cutting into the plaster surfaces to emphasize the elegant contours of the etched lines, and using color to great advantage” (Ashton). These boldly innovative plaster reliefs were among some of his most successful works of the 1930s and were shown both in Paris and later in New York at the Pierre Matisse Gallery. Ferren’s works from 1935 to 1939 are characterized by “complex, yet subtle fusions of mechanical-geometric and natural, even biomorphic forms” (Lorenz). Ferren’s use of color is the most profound aspect of these works, whether in his pastels, oils, watercolors or hand-colored etchings on plaster. Ferren’s paintings from this period are “incredibly luminous and subtly modeled” and the colors “seem to glow and radiate warmth” (Lorenz). As “an expert in the bullfight” and because he was “fascinated by romantic ritual,” Ferren attempted to evoke a certain emotional and spiritual effect through his (Lorenz). Ferren resisted absolutism and instead articulated “evocative relationships of form and color,” which he described as “looking like ‘Mars spaceships’ and which take on landscape references as well” (Lorenz). 1. Ashton, Dore. John Ferren: (1905-1970). Exhibition catalogue from Galerie Pierre. May 1935. 3. John Ferren: 1905-1970, Works on Paper Done Between 1929 and 1940. A.M. Sachs’ Gallery Exhibition, April-May, 1978.